I had a little time before heading over to school today so I thought I’d check out the color challenge on SCS. Since today is their 500th challenge (WOW!!) I just HAD to play along. They have 4 different color combo – one for each season and the fall one caught my eye. 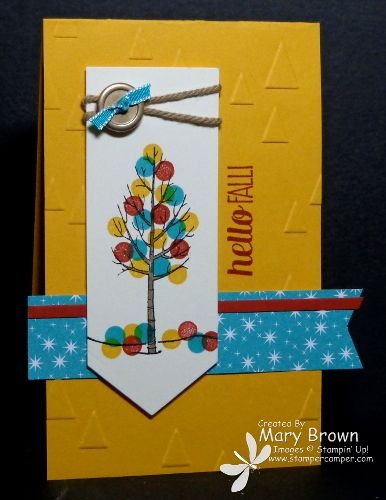 I had the White Christmas set ‘on top of my desk’ for another project I’m working on and then I saw the technique challenge on SCS was to use a pencil eraser…so you put the two together and viola…you have a fall tree! Bermuda Bay star print (Motley Monsters dsp) – 1 x 4 1/4, cut into a banner. Cajun Craze – 1/8 x 4 1/4, add to banner then add to card front. Very Vanilla – 1 5/8 x 4 3/8 us the bottom side of the banner framelit to cut into a point. Stamp single tree using using StazOn Jet Black. I used the Project Life Journaling pen to extend the ‘ground’ to the end of the flag. Wrap Baked Brown Sugar Twine around top, add dimensionals to flaf and add to card front. Tie knot in piece of Bermuda Bay 1/8″ taffeta ribbon, add to Gold Basic Button and add button to flag using dimensionals. Stamp greeting using Cajun Craze. I think this turn out SOOOOO cool and another use for the White Christmas set! This entry was posted in Challenge, Holiday Mini and tagged For All Things, White Christmas. Bookmark the permalink. So clever! I love it Mary! 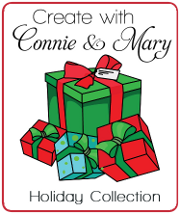 What a fun and clever card Mary – great additional use for this set!